I'm hoping that you can either help me or point me in the right direction please. I'm researching my grandfathers death in 1938. Since about 1920 he worked at Hanley deep pit first as an employee and then as a contractor. We know he was in a pit rescue team because he received an extra pound a week for it. However, in about 1926, the story within the family was that he was on a rescue when a ton of coal fell on him, after which he was unable to work in the pits again. We don't think that it was a pit disaster, just a case of a rescue gone wrong. I've tried Iron Mountain but they say they don't have records for him. I've also tried to find out who holds the records for the Mines Rescue Service that was in Glebe Street Stoke, after it was demolished in the 70's to make way for the A500, as he would have had his training there. If you know of anyone who could help me I'd be really grateful, his name was James Humphries and he lived at 3 Blackwell Street, Cobridge. I have attached a copy of a mines rescue certificate and it's this line that we are hoping to pursue. 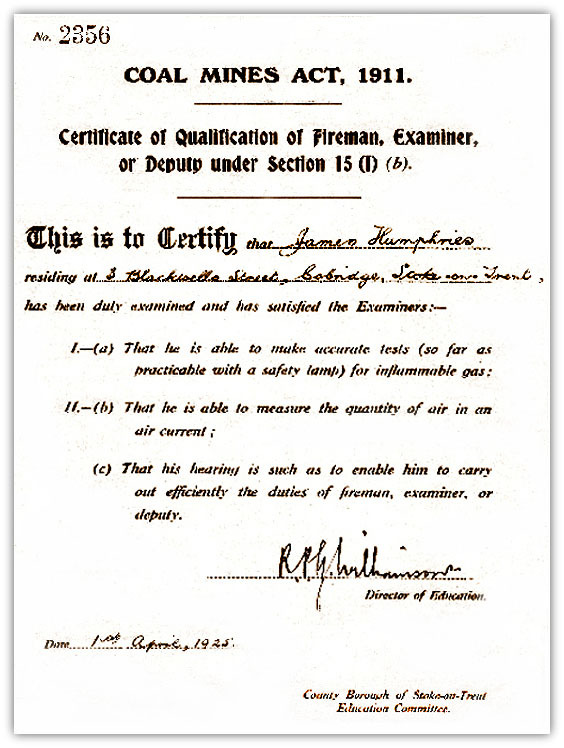 I would have thought that this cert would have been issued by Stoke Mines and Rescue but it wasn't, however, it does have a certificate number on it which indicates it came from a book, have any of your contacts come across this before, he must have gone through some sort of training and it's those records that would be helpful to us.